The Duchess of Cambridge cooked up a storm in her final royal visit before starting maternity leave. Catherine and Prince William helped prepare the finishing touches for this year's Commonwealth Big Lunch, which included dishes from India and Jamaica. The duchess is due to give birth to her third child in April. Her last appearance comes as pictures of Prince Harry and Meghan Markle's 600 wedding invitations were released by Kensington Palace. The Commonwealth Big Lunch aims to bring together as many people as possible for a sit-down meal. The community lunch originates from the Eden Project charity in 2009, with more than nine million people taking part last year across 53 commonwealth countries. Chef Matt Jones, 45, from Seattle, who has been at the event for several years, said it was "fantastic". "As we got them to decorate our dishes Kate said she cooked with her kids but that it sometimes got a bit messy," he said. 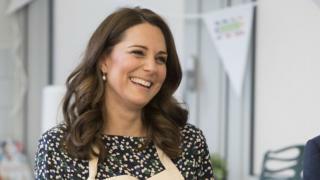 He added that he was "very intrigued" about one of the royal couple's favourite recipes for buttered chicken, which they shared. Earlier, the duke and duchess watched a wheelchair basketball session at the Olympic Park in Stratford before meeting players who hope to compete in the 2022 Commonwealth Games in Birmingham. They also tested their knowledge of the Commonwealth during a quiz with athletes and coaches. The royal engagements are the last in a busy string of duties that the duchess has undertaken over the past few weeks. On Wednesday, the duchess set up a major project that explores the ways in which children can be supported to prepare them for the challenges of adult life. She also recently attended her first official event with soon-to-be royal Meghan Markle, when the two took part in a Royal Foundation question and answer session with Princes William and Harry. Prince Harry and Meghan Markle are getting married at St George's Chapel in Windsor on 19 May. Bookbinder Barnard and Westwood produced the invitations, which were issued in Prince Charles's name. Around 200 additional guests are being invited to the evening reception at Frogmore House. Each invitation is made of thick white card and printed via a process called die stamping, with gold and black American ink. The cards are gilded along the edge, and have been burnished. Barnard and Westwood has held a Royal Warrant for Printing & Bookbinding by Appointment to Her Majesty The Queen since 1985. According to the palace, the bookbinder's managing director, Austen Kopley, said he was "thrilled and honoured to be making them".